If you are in a team, it’s worth taking time out at some point to look at how each member’s personality preference tends to play out during team work. For example, do some members tend to dominate discussions, while some tend to remain quiet? Do some prefer to brainstorm ideas whereas others would prefer to quietly reflect on solutions? Tools like the Myers-Briggs Type Indicator (MBTI) are often used to facilitate this reflection. The MBTI can also show a likely tendency of the team to focus more towards details or more towards ideas, and could show if there is any potential bias towards or against relationship building. And very importantly for a project, it could show if there will likely be a strong focus towards tightly managing the schedule or accommodating emerging opportunities. Understanding personality preferences simply enables you to be mindful of how preferences could play out for better or for worse – when people are mindful of this, they are much better placed to appropriately manage their own behavioural tendencies and to work constructively with others’ preferences. The team leader in particular needs to be cognisant of group bias and on occasions deliberately manage the process to mitigate the risk associated with it. For example, having a strong desire to finish the job well ahead of schedule can be a very good thing most of the time but if it means avoiding making the changes necessary to accommodate an emerging requirement, or to achieve the quality expected by a customer, then it’s not so good. The potential for this happening escalates if all team members have a very clear “judging” preference, in MBTI terms. But if the leader is alert to such bias, action can be taken to counter it. 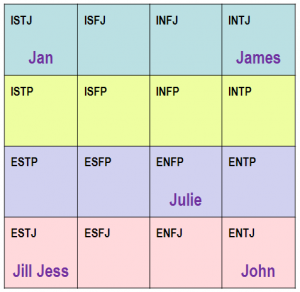 In this example, you can see the 16 possible MBTI combinations and also note that two people have similar profiles. But further to this, you can also see that four of the five have a “judging” (J) preference which could be worth watching if you are the team leader. In this example, you can see the 16 possible MBTI combinations and also note that two people have similar profiles. But further to this, you can also see that four of the five have a “judging” (J) preference which could be worth watching if you are the team leader. We typically enter into group-based situations with the assumption that all people think the way we do about things. When you take a little time to explore personality preferences, values, strengths and so on, it opens your mind to the extent of difference that usually exists in a team. This difference is, in fact, a virtue; it typically leads to more effective decision-making and a richer team experience. Just being aware of that difference can give each member a whole new sense of appreciation for where others are coming from and how best each can work with the other. And that all contributes to great team play!